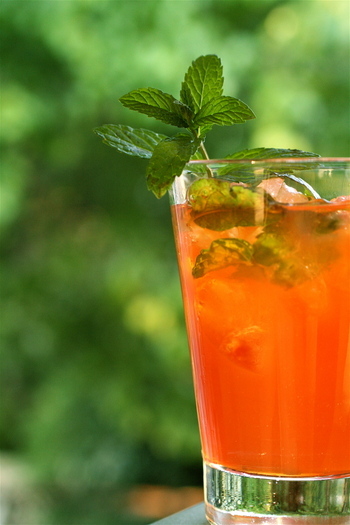 If you're a fan of bourbon, mint and tea, this is the recipe for you. We found that it produced just the right ratio of these ingredients without being too sweet. Needless to say there wasn't any leftover from the evening. We're always looking for new ideas for bourbon drinks. Have one you want to share? In a large saucepan, boil 4 cups water. Add 1/2 cup sugar; stir to dissolve. Remove from heat; add 8 teabags of black tea. Steep 10 minutes; discard teabags. Add 4 cups cold water; transfer to pitcher, and chill. Add 1/2 cup fresh mint leaves. Using a wooden spoon, crush mint until fragrant; stir in 2 cups bourbon. Serve over ice.